Telltale games are story-driven sagas that involve a lot of dialogue choices, but Batman is not a chatty guy. Because of that, a lot of what you appear to do when controlling Batman in this game is tap buttons and flick analog sticks to orchestrate fights. In the first 15 minutes of the E3 demo, Batman is sneaking up on some heavily-armed guys who have broken into city hall. He’s stalking them from the shadows, tying them up, snatching them into the air with his grappling hook. You know, Batman stuff. Later, he’s on the roof exchanging punches and kicks with Catwoman as she tries to abscond with a stolen hard drive. There’s some Batman-Catwoman banter, some mid-fight dialogue choices, but the player is mostly reacting to prompts to keep the fight going. In the latter half of the game’s E3 demo, the player controls Bruce Wayne and the pace changes. Bruce is holding a gala at Wayne Manor for Harvey Dent, who is running for mayor of Gotham City on an anti-crime platform. Bruce is schmoozing with rich people, talking up Dent’s potential. Suddenly, crime boss Carmine Falcone walks in. Dent invited him, raising all sorts of questions about what his deal really is. Wayne and Falcone go off to a side room to have a tense discussion. There are numerous dialogue choices and other decisions to be made throughout this scene. You’re choosing what to say as you greet your guests. You’re picking which campaign slogan Dent should use. You’re deciding whether or not to shake Falcone’s hand. You’re coolly replying to Falcone’s taunt that he knew Bruce’s dad longer than Bruce did. 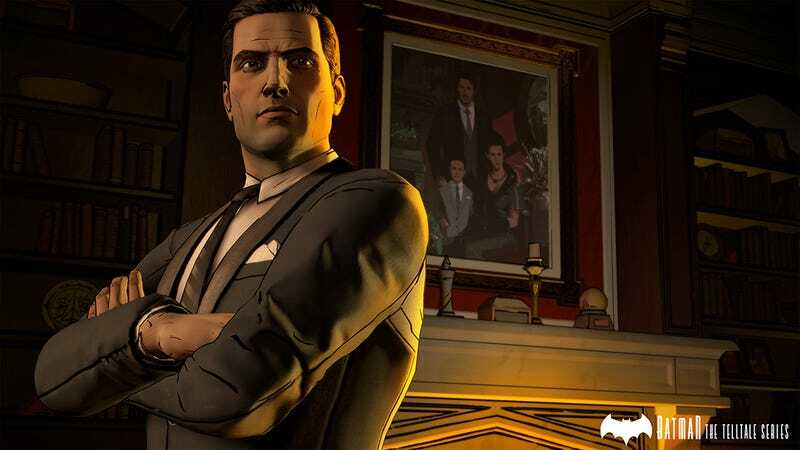 Telltale describes the Bruce Wayne parts of their game as political and personal. Even from the little bit shown in the party scene at E3, it’s obvious there’s a lot they can do with that part of the Batman character. The problems pitched at the player are typical for Batman stories but atypical for Batman games. Bruce’s butler, Alfred, is stressed about how hard Bruce is pushing himself. Some friends of Bruce’s parents demand Bruce’s attention and want to talk about the direction Gotham is going in. Reporter Vicki Vale seems to be poking around for a story about Bruce Wayne and can’t help but notice blood on his collar. The story will unfold, like all Telltale games, as a series of interactive episodes staring this summer, coming to the usual variety of consoles, computers, phones and tablets. The story is original, drawing influence from Batman lore but not retelling any known adventures. Reps for the company say that the names of characters might seem familiar, but that the roles they play may surprise fans. Most video games involve action, so most Batman games have involved the thug-punching, Batarang-throwing part of Batman. We’ll see if that action aspect of Batman can help this Telltale game feel more dynamic, but it’s clear even from the demo at E3 that the story aspect of Telltale is going to enrich Batman’s gaming offerings. We’ve never really been able to be Bruce Wayne in a video game before, not in a substantial way. That looks to be changing and has the potential to make one of the most popular characters out there feel fresh as a video game character once again.